We want the BEST! The new RUCKUS will revolutionize the pre-workout game, and the flavor will have you CRAVING your next workout. We brought the RUCKUS back - And it’s back with a vengeance! 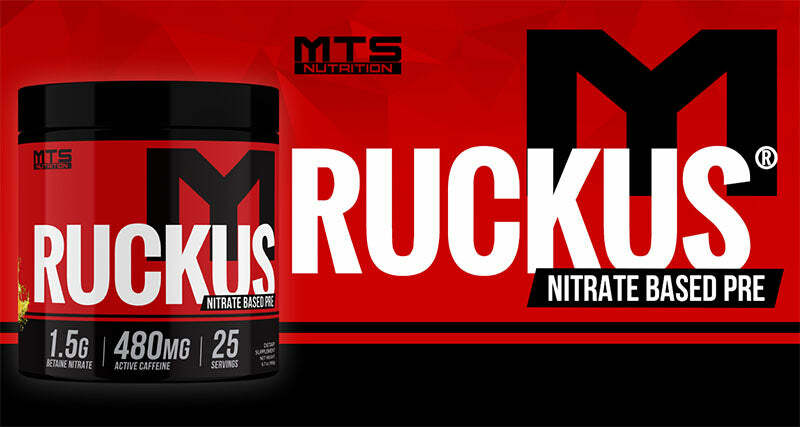 MTS Nutrition RUCKUS™ is an all-time best seller on TigerFitness.com. Then we took it away. Why the heck would we do this? Simple. Even though it was loved and sold extremely well, we could do better… And better we did! Adding to the NO3T Nitrate-Driven Pump and Extreme Energy formula, we added compounds to ensure maximum ATP-output (elev-ATP®) - without the use of creatine. Nitrates are one of the most powerful nitric oxide boosters in existence. Naturally occurring in beets, spinach, quinoa, and numerous other plants, nitrates operate as potent vasodilators in the body[3,4] which increases blood flow to your muscles, translating to some of the biggest muscle pumps you’ve ever witness! But that’s not all, nitrate supplementation also improves athletic performance and energy efficiency by reducing the oxygen cost during training. [6,7] Essentially, your muscles will become more efficient, allowing you to train at the same intensity you’re used to, but without as much fatigue. Also added were mental-focus agents in scientifically-validated doses, and a sustained-release energy matrix that combines Infinergy™, VitaShure®, pure caffeine, ultra-pure theobromine, N-Methyltyramine, Hordenine, and L-Tyrosine plus L-Taurine. Betaine nitrate, also known as trimethylglycine (TMG), is a reputable supplement that has been used with excellent results. Naturally occurring in several plants including beets, spinach, and quinoa, this ingredient has shown encouraging results in numerous studies. Betaine has been shown to have affirmative results by helping to protect proteins, cells, enzymes, and proteins from stresses such as dehydration and extreme temperatures. Betaine nitrate has been shown to have the ability to improve body composition quickly. A six-week study showed that participants were able to lose 3% body fat while gaining over 5 pounds of lean mass while using betaine nitrate. They also increased bench press power and arm size during the study. Supplementation with betaine nitrate has increased power, force, and strength in bench press and squats; furthermore the quality of reps performed and endurance with the squat exercise are also amplified with betaine nitrate supplementation. One reason betaine nitrate is able to help your endurance and extend your workouts is by increasing both aerobic and anaerobic metabolisms. It may also increase performance during workouts by improving fatty acid and lactate metabolism – all while expanding intracellular volume. Cortisol levels have been lowered when using betaine before exercising. Additionally, betaine nitrate may have multiple mechanisms that increase nitric oxide blood levels to assist in the increase of vascular function. Taurine is a triple-headed beast of an amino acid. First and foremost, this amino enhances cellular hydration, aiding hydration and endurance while training. It also synergizes with caffeine to promote mental clarity, providing for some of the clearest focus you’ve ever experienced in a pre workout. Finally, taurine also speeds recovery and significantly reduces muscle breakdown induced by intense training. Simply put, everything from focus to performance to recovery is better with taurine! Taurine also increases blood flow, an impressive trait that allows more nutrients to reach your muscles as you exercise. This helps increase protein synthesis as you build muscle mass. Ingesting taurine before exercising can improve performance in trained athletes and research shows that taurine speeds recovery time and helps protect muscle damage caused by exercise, significantly reducing muscle breakdown, increasing the results of your workouts. Taurine is also well researched as a regulator of cell volume. Taurine regulate fluid balance and helps maximize hydration at the cellular level to optimize muscle function. This strongly suggests taurine is also a cell volumizer to supply another stimulus for anabolism. Supplementation with taurine has also been shown to increase endurance when running. Taurine has numerous benefits as shown in this previous article on Tiger Fitness. Focus is a crucial, yet highly underrated, aspect of training. Without it, you might as well not even be at the gym. But when you are focused, the quality and effectiveness of your workouts is amplified 100-fold. That’s where L-Tyrosine comes in. This amino acid enhances production of the dopamine, adrenaline (epinephrine), and noradrenaline (norepinephrine), three important neurotransmitters key to focus, attention, and alertness. [1,2] Tyrosine also exerts some anti-stress benefits when consumed prior to training, helping you stay in the zone no matter how long you’re battling the iron. Developed by Creative Compounds, Infinergy is a form of slow-release caffeine that provides a longer, smooth infusion of energy into your central nervous system than caffeine anhydrous. Formed from caffeine and malic acid, Infinergy ensures long-lasting energy that won’t bottom you out or leave you feeling jittery. In essence, Infinergy is the slow burn that keeps your engine running through the longest training sessions you’ll face. Almost everyone in the gym has taken advantage of this glorious substance to assist us at one time or another. Caffeine is a staple in numerous pre-workouts, but Ruckus doesn’t use your typical caffeine. Creative Compounds developed and produces a specialized form of caffeine named Infinergy, an ionic bond of caffeine and malic acid to increase energy and mental focus. Infinergy may also be easier on sensitive stomachs and is an excellent way to increase mental focus while supplying a surge of energy. elevATP® is a revolutionary compound developed by FutureCeuticals. Comprised of “ancient peat” (fossilized plants) and apple extracts, elevATP is a highly bioavailable form of exogenous ATP shown to increase intracellular ATP in blood cells. This makes for better energy production while training and improved recovery between sets, yielding improved performance and superior gains. In fact, a 2016 study using 150mg dose of elevATP (the same dose included in Ruckus), found the novel ingredient improved strength and power output in resistance-trained men, meaning its beneficial for the grizzled vets of the iron, and not just gym newbies. Manufactured with a well-researched combination of “ancient peat” and apple extract, elevATP was developed and produced by Futureceuticals. A recent study has shown promising results with increased muscle hypertrophy when supplementing with elevATP. N-Methyl Tyramine (NMT) is found naturally PEA alkaloid readily found in a number of plants including bitter orange, barley, and acacia. It stimulates the release of the potent catecholamine noradrenaline (norepinephrine) which bolsters focus, energy, alertness and motivation. NMT also enhances serotonergic and adrenergic neurotransmitter release, leading to heightened mood and sense of well-being. This ingredient helps to keep you focused on the task at hand. Known far and wide for its ability to instantaneously ignite the sense and shock you into action, caffeine anhydrous is the perfect complement to the slow-acting energy of Infinergy. Combining these two forms of the world’s oldest and most popular stimulant creates an unbeatable combination of immediate and long-lasting energy that brings you up and never lets you down. Rounding out the trifecta of caffeine forms present in Ruckus is VitaShure, an advanced sustained-release form of the stimulant that ensures you never run out of energy during or after your training is over. VitaShure’s unique encapsulation process creates a smooth and consistent release of caffeine that makes for a steady high and gentle come down after the ride is over. A relative of caffeine, theobromine is another slow-acting stimulant that helps provide smooth, sustained energy, offsetting any possible “crash” that’s notorious with other high stim pre workouts. Theobromine also aids cognitive function, blood flow, and pumps while training due to its ability to function as a vasodilator. Better energy and pumps from one ingredient? We’ll take that hand over fist! Theobromine can aid in fat loss and provide that extra blood flow and PUMP. Theobromine has even been linked to having an aphrodisiac effect! All of this alongside a smooth, controlled stimulant release like caffeine make it a must! 1. Fernstrom JD, Fernstrom MH. Tyrosine, phenylalanine, and catecholamine synthesis and function in the brain. J Nutr. 2007;137(6 Suppl 1):1539S-1547S; discussion 1548S. 2. Deijen JB, Wientjes CJ, Vullinghs HF, Cloin PA, Langefeld JJ. Tyrosine improves cognitive performance and reduces blood pressure in cadets after one week of a combat training course. Brain Res Bull. 1999;48(2):203-209. 3. Kukovetz WR, Holzmann S, Romanin C. Mechanism of vasodilation by nitrates: role of cyclic GMP. Cardiology. 1987;74 Suppl 1:12-19. 4. Cosby K, Partovi KS, Crawford JH, et al. Nitrite reduction to nitric oxide by deoxyhemoglobin vasodilates the human circulation. Nat Med. 2003;9(12):1498-1505. doi:10.1038/nm954. 5. Coles LT, Clifton PM. Effect of beetroot juice on lowering blood pressure in free-living, disease-free adults: a randomized, placebo-controlled trial. Nutrition Journal. 2012;11:106. doi:10.1186/1475-2891-11-106. 7. Lansley KE, Winyard PG, Fulford J, et al. Dietary nitrate supplementation reduces the O2 cost of walking and running: a placebo-controlled study. J Appl Physiol. 2011;110(3):591-600. doi:10.1152/japplphysiol.01070.2010. 8. Pasantes-Morales H, Quesada O, Morán J. Taurine: An Osmolyte in Mammalian Tissues. In: Shaffer S, Lombardini JB, Huxtable RJ, eds. Taurine 3: Cellular and Regulatory Mechanisms. Boston, MA: Springer US; 1998:209-217. doi:10.1007/978-1-4899-0117-0_27. 9. Warburton DM, Bersellini E, Sweeney E. An evaluation of a caffeinated taurine drink on mood, memory and information processing in healthy volunteers without caffeine abstinence. Psychopharmacology (Berl). 2001;158(3):322-328. doi:10.1007/s002130100884. 10. da Silva LA, Tromm CB, Bom KF, et al. Effects of taurine supplementation following eccentric exercise in young adults. Appl Physiol Nutr Metab = Physiol Appl Nutr Metab. 2014;39(1):101-104. doi:10.1139/apnm-2012-0229. 11. Reyes T, Shu C, Argumedo R, Nemzer B, Pietrzkowski Z. The Effect of ElevATP on Whole Blood ATP Levels: A Single Dose, Cross over Clinical Study. Vol 1.; 2014. 13. McGovern T, McDevitt E, Wright IS. THEOBROMINE SODIUM SALICYLATE AS A VASODILATOR . Journal of Clinical Investigation. 1936;15(1):11-16. 14. Evans CS, Bell EA, Johnson ES. N-methyltyramine, a biologically active amine in Acacia seeds. Phytochemistry. 1979;18(12):2022-2023. doi:https://doi.org/10.1016/S0031-9422(00)82727-2.